Whether you are a business woman or a working mom, you want your wardrobe and accessories to be a reflection of your personality. While no woman wants to be on the don't list, you also don't want to blend into the background. How do I navigate that delicate balance? Personally I like to have one or two statement pieces that work into my whole wardrobe. Recently, I received a bracelet from Super Jeweler. Super Jeweler believes that chic, high-quality jewelry doesn't have to break the bank. Featured on shows including Rachel Ray and The Talk, Super Jeweler offers high quality jewelry at incredible prices. From diamonds to fashion jewelry, this store offers pieces that fit into today's trends yet can stand the test of time. 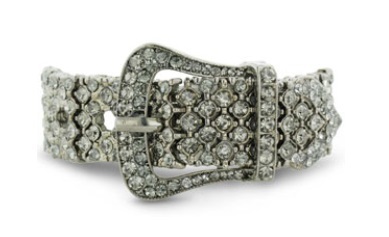 My bracelet is the Grey Crystal Studded Adjustable Belt Buckle Stretch Bracelet. This buckle cuff style bracelet in on trend for 2013. The stretch makes is easier to wear than a solid cuff. The buckle is adjustable to make more comfortable for a variety of sizes. After watching the award season red carpets, the gun metal/grey color is hot right now. The color is subtle yet the sparkle from the crystals makes for added elegance. This piece stands out in all the right ways. What I like about this bracelet is that it can be worn casually or dressy. Paired with skinny jeans and boots, I have a little edge and glam to my look. With my little black dress, the bracelet adds a sophisticated touch to my big date night. I love the idea of having a piece that coordinates with several looks because versatility is key to my wardrobe. 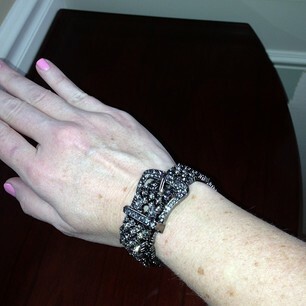 The Grey Crystal Studded bracelet retails for $69.99 but can be purchased at Super Jeweler for just $29.99. Give yourself or the woman in your life a new piece of jewelry that will make her sparkle. The perfect bling is just a click away at Super Jeweler. Disclosure: I received this jewelry in exchange for my honest opinion. awesome prices and great jewelry. This site has some super-cute jewelry at great prices! Thanks so much for letting me know about it! What a neat looking bracelet! Now that my boys are older, I'm finally thinking about dressing up more often. Love that bracelet and the price! I dig it! I am totally into the trendy blink that can go casual or a bit dressier. Very fun, and a great price! That bracelet is cute! I love how the belt makes it interesting to look at. Super cute bracelet! It's totally my style...something I could wear with jeans or a dressy outfit! thanks so much for sharing, the site has so much to offer. The buckle design on your bracelet added uniqueness and personality to the piece. That bracelet is really pretty! And I love the price tag! Very cute! I like the big buckle bracelets like this. Amazing! I have to show it to my husband!! That is really cute! I love it! And love that you get can it for a great price from them! those are beautiful! I'm a bracelet girl and really would like one of those. This is such a pretty and functional bracelet. I like that it stretches and has an adjustable buckle. Cute bracelet and very blingy! They seem to have a big selection of jewelry items. Wow so pretty and unique! oooh I love it! How cute and unique! That bracelet is awesome love it!